We all LOVE good food! Carbeth Fishery is located just outside the picturesque village of Blanefield in Scotland. Blanefield is approximately half an hours drive from Scotland’s largest city, Glasgow and half an hour drive from Stirling, one of Scotland’s most beautiful large town’s. It’s a beautiful place to fish. The fishery has 3 ponds for bait and fly fishing. The fishery is stocked with Rainbow trout usually a minimum of 2lb in size. 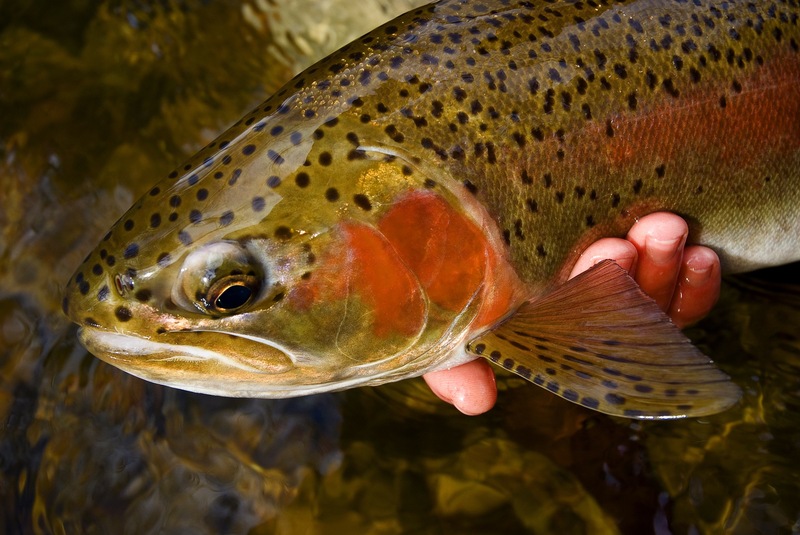 Many may say that there is no skill in fishing at fisheries and although it’s true that the ponds are filled with trout you are not necessarily going to catch a fish. These fish are clever and there is plenty of sport to be enjoyed at Carbeth Fishery. The fishery has an onsite shop where you can purchase what you require for a day’s fishing including bait. The shop also rents out fishing Rods. The on site shop also sells food including tea/coffee and even sweets to keep the children happy. There is a ladies and gents toilet on site. They are not the finest toilets you will ever visit though but they do the ‘job’. A childrens change facility would be useful including baby change as many families enjoy to go fishing. When we visited the fishery there was a great atmosphere. Lots of families were enjoying a relaxing day fishing and kids loving the sport of catching fish and the excitement of reeling a trout in. The ponds are depp though so children need to be carefully supervised at all times. There is a whole variety of anglers at the fishery including those fishing for the first time to the most experienced anglers. The experienced anglers on the day we visited were more than happy to share their skills and tips. The staff are great and ‘Jack’ and ‘Paul’ who we met on our fishing day were very helpful indeed. We were learning how to fish and they were more than happy to lead and guide and make sure that we had a great time including the children. Carbeth fishery is a lovely place to fish and very relaxing. We loved our day there and will be going back for more. The Dark Ages heralds the first recorded mention of a town on the site of St Andrews, then called Kilrymont. The earliest inhabitants of the area were farmers and fishermen, but their simple lifestyle was to be entirely transformed in the medieval era due to the arrival of monks, pilgrims, academics, merchants and armies. Our image (right) shows the St Andrews official coat of arms, showing St Andrew and a boar (the name given to the area in the Dark Ages was Muckross, derived from “muick” meaning “boar” and “ross” meaning “promontory”. The coat of arms incorporates the town’s motto “Dum Spiro Spero” – “While I breathe, I hope”. (Please note, use of the coat of arms is strictly regulated by the Royal Burgh of St Andrews Community Council and it may not be used without consent). Religion was a strong influence in the development of St Andrews (the name change came about because of the legend that the bones of the Christian apostle St Andrew were brought here). Celtic monks built the chapel of St Mary on the Rock, the ruins of which still stand near St Andrews Harbour, and the imposing St Rule’s Tower was initially part of the first church of the Augustinian priory in St Andrews. St Andrews’ great Cathedral – constructed in 1160 – was for seven centuries the largest building in Scotland. Its majesty helped to establish St Andrews as the centre of the country’s religious life, which in turn helped St Andrews to become hugely influential in Scottish political circles. Pilgrims flocked here from all over Europe, and St Andrew became the patron saint of Scotland. Medieval St Andrews supported two further friaries: one founded by the Dominicans (Blackfriars), whose ruined chapel still remains on South Street, and later another by the Franciscans (Greyfriars) for whom the only remaining mark on St Andrews is a street name. During this period, the town was concentrated around the harbour and cathedral areas, and extended as far inland as the present line of North and South Castle Street. But greater prosperity, a rising population and the growing importance of St Andrews as an ecclesiastical, academic and trading centre (the University was founded in 1413) all contributed to the expansion of St Andrews during the middle ages. Development took place along four parallel main streets – South Street, Market Street, North Street and Swallowgait (now known as The Scores), and strategically-located ‘ports’ (gates) controlled the movement of goods and people. The West Port at the end of St Andrews’ South Street is Scotland’s best surviving example of a fortified gate. 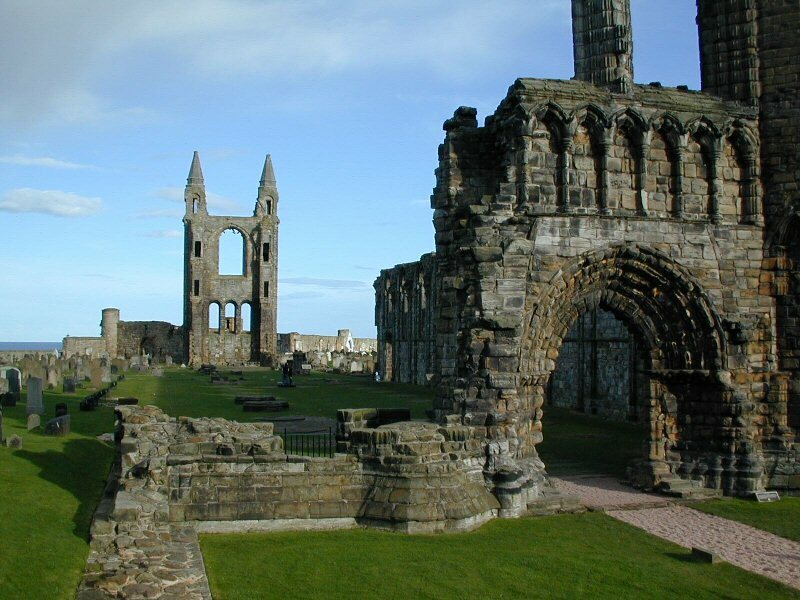 The 16th Century was the most turbulent period in the history of St Andrews. The (Catholic) Archbishop of St Andrews, Cardinal David Beaton, was the leader of the anti-Protestant movement within the Scottish church and orchestrated the trials and executions of several ‘heretics’. Before long, Beaton too was dead – victim of an assassination in this volatile atmosphere. In 1559, the Calvinist John Knox preached a fiery sermon in Holy Trinity Church which reputedly sparked off a riot amongst the congregation. St Andrews Cathedral was sacked by Knox’s followers, and this effectively signalled the start of the Scottish Reformation and the end of the town’s religious influence. St Andrews is scattered with reminders of these bloody times. Martyrs’ Monument, on The Scores, commemorates the Protestant reformers who died, and markings on street cobblestones indicate where executions took place. Look out for those of Patrick Hamilton outside St Salvator’s Quad, and George Wishart just outside St Andrews Castle. St Andrews fell into a long period of decline, only reviving in the 19th Century, when new streets were built, the railway arrived, and the town became known as a holiday destination, renowned for its golf and bracing sea air. Since then, it has never looked back, with considerable population growth and University expansion taking place during the late 20th Century. However, the original medieval street layout has been retained to this day, contributing immensely to the character of St Andrews. Over the last few centuries, residential developments have stretched St Andrews’ boundaries to the south and west but the historic core remains much as it would have looked four hundred years ago. Today’s residents guard the St Andrews’ past jealously, and they are proud to call themselves St Andreans. Enjoying royal patronage, the Royal and Ancient Golf Club of St Andrews (R&A) acquired both status and prestige. 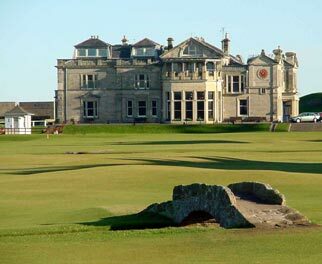 Its famous clubhouse was built in 1854 and gradually the R&A became regarded as the premier club in the world. With golf booming in popularity across Britain and overseas, the R&A published the first ‘Rules of Golf’ in 1897 and since then it has been recognised as the sport’s ruling body throughout nearly the entire world (only the USA and Mexico are excluded). It took over the management of The Open Championship in 1919, and the Open Championship has now been held at St Andrews no fewer than 27 times. Despite its high profile, the R&A does not own any golf courses in St Andrews or elsewhere – the St Andrews links courses are on publicly-owned land and are open to all (except during tournaments). Today, St Andrews is recognised across the globe as the ‘Home of Golf’. Golfing in St Andrews – at the spiritual heartland of the sport – is the ultimate ambition of many golfers. It is a dream that comes true for many thousands of players each year, because golf at St Andrews remains true to its Scottish roots as a game for all. St Andrews is one of the world’s greatest small universities. Founded in 1413, it’s the third-oldest in the English-speaking world (preceded only by Oxford and Cambridge) and enjoys an international reputation for the quality of its teaching and research. To gain a sense of the University’s antiquity, visitors are normally welcome to enter the beautiful quadrangles of two of the original colleges – St Mary’s on South Street (endowed in 1538) and St Salvator’s on North Street (1450). In the peaceful enclave of St Mary’s, a thorn tree allegedly planted by Mary Queen of Scots in 1565 still survives. The University’s buildings are spread across the whole town and the institution is steeped in tradition. The annual Kate Kennedy Procession attracts large crowds to St Andrews’ medieval streets in April, and another long-standing custom is undertaken weekly after Sunday chapel, as red-gowned students embark on their traditional walk along St Andrews’ pier. Raisin Weekend is a boisterous event held each autumn. However, the University has many more recent claims to fame; it was the first Scottish university to admit women undergraduates (1892) and began the first designated students’ union in Britain (1888). St Andrews alumni include such luminaries as John Wilson (inventor of logarithms), James Wilson (one of the fathers of the American Constitution), James Black (Nobel Prize winner), Fay Weldon (novelist), Alex Salmond (politician), Chris Hoy (cyclist) and, in the early years of the 21st Century, Prince William and Catherine Middleton – now the Duke and Duchess of Cambridge. The University of St Andrews balances its traditions and medieval origins with its reputation as a modern, cosmopolitan seat of learning. Whilst it has changed – and grown – over the last six centuries, one thing that has remained constant is the way in which it is integrated into the local community. Its ancient and modern buildings make a substantial contribution to the attractiveness of St Andrews, and, during term-time, its 7,000 students (one-third of whom come from overseas) add liveliness and vigour to the town’s shops, restaurants and pubs. In short, the University remains a vital ingredient of the unique blend that is modern-day St Andrews. You are guaranteed a wonderful welcome from the locals. They are very proud of their beautiful town and want people to enjoy all that St. Andrews has to offer. As well as the obvious golf attractions there are many Historic Scotland attractions which can be visited for a fee. The beach is long and sandy and clean. There are lots of sports to take part it including surfing with many surfers taking to the seas and happy to provide a show. There are many places to stay to suit all budgets. It is worth bearing in mind that during large events such as ‘The Open’ then accommodation should be booked well in advance. Website details below will provide useful links for finding places to stay. St. Andrews is a wonderful town in a wonderful country with lots to see and do. If you visit St. Andrews we hope you have a wonderful time. We certainly did. 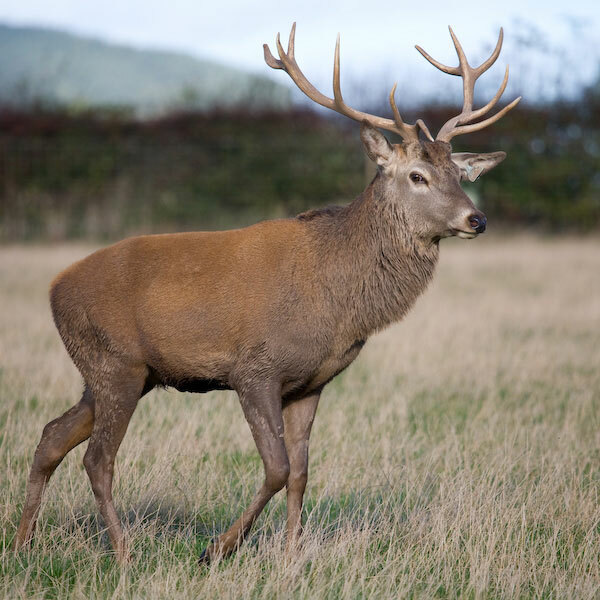 The Scottish Deer Centre is set in the Fife countryside and covers over 55 acres. The collection includes 14 species of Deer from around the world, Fife’s only Wolf pack, Otters and other rare Scottish species including the Wildcat. 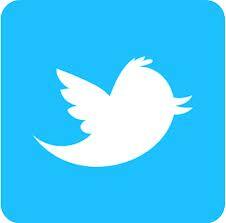 The centre also hosts the Raptor World Bird of Prey centre! There are daily Bird of Prey shows. Other than the animals there is plenty to occupy the children including fantastic play areas, go-kart course (free), play park area including aerial runways and a gift shop. There is also on site shopping including woolen mill shop, cafe and souvenir shop. If you want to adopt an animal (for a fee) you can do this too. We spent a wonderful afternoon at the centre and you really can get up close to the animals. We saw lots of different species of deer and other animal such as wolves, wild cats and bird of prey. When we visited an enclosure was being prepared for soon to arrive European Brown Bears which should add an extra appeal to the park. The children really enjoyed the go-karts and the play park areas. 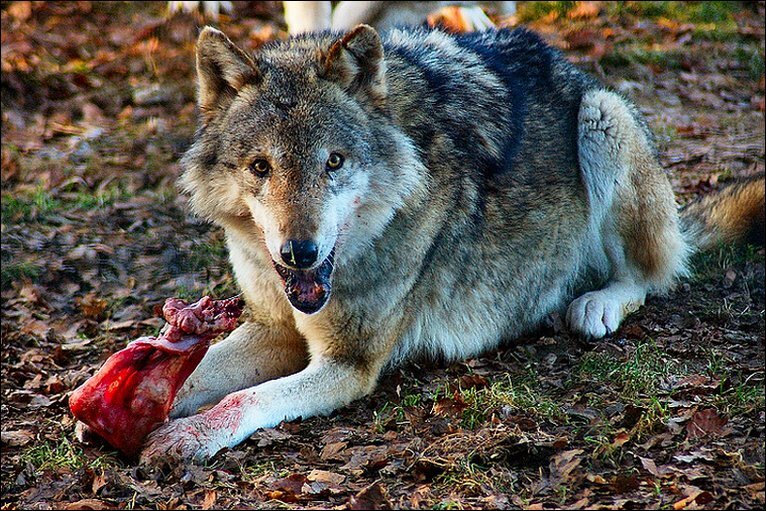 There was also feeding of meat to the wolves and an educational talk which the children and adults really enjoyed. As per usual in Scotland the weather plays a big part in the enjoyment levels. The day we went was lovely and sunny. The main of the park requires you to be outdoors therefore best visit on a dry day. Overall it was an excellent visit and it was enjoyed by all. Follow the M90 past Kinross then exit motorway at J8 for St Andrews (A91) follow the A91 through Gateside and Auchtermuchty. At Melville Lodges roundabout take 2nd exit, continuing on the A91 for approximately 1.5 miles and you’ll find us on your right. Follow the A92 for approximately 14 miles then at Melville Lodges roundabout take 1st exit on left, following the A91 for 1.5 miles and you’ll find us on your right. Follow the A91 east for approximately 21 miles through Alva and Dollar, then turn left on to M90 ( Perth) for 2 miles and exit M90 at J8 for St Andrews. Follow A91 through Gateside and Auchtermuchty and at Melville Lodges roundabout take 2nd exit, following the A91 for 1.5 miles and you’ll find us on your right. Follow the A91 west for approximately 13 miles through Dairsie and Cupar, and you’ll find us on your left.